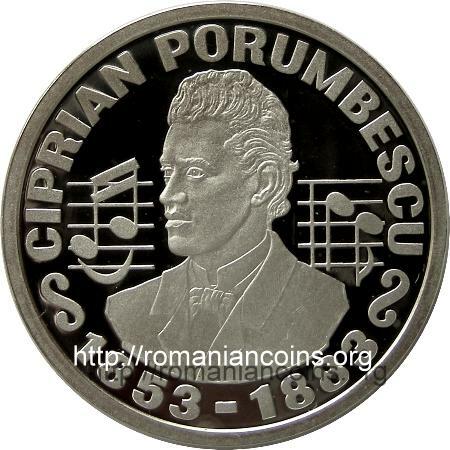 Composer Ciprian Porumbescu was born in 1853 in the village of Şipote, (nowadays in the county of Suceava), inside the Romanian province of Bucovina that at the time was occupied by Austria. He is considered to be one of the predecessors of Romanian music. During his studies in Vienna he edited a "Collection of Social Songs for the Romanian Students". 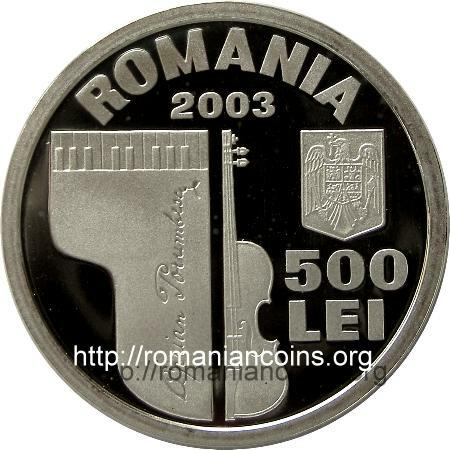 His best known creations are operetta Crescent, Serenade, Ballad for Violin and Piano (the violin and the piano appearing on this very coin). 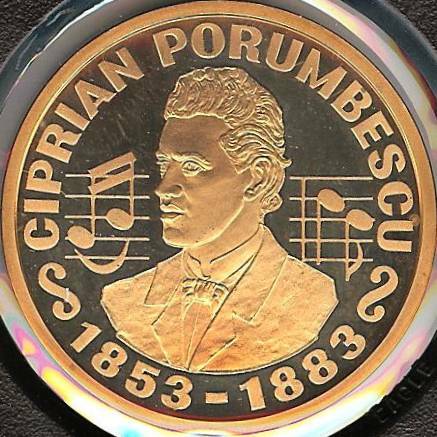 Ciprian Porumbescu composed the music for the Albanian national anthem, "Hymni i Flamurit", i.e. Flag's Hymn, song known in Romania as the famous patriotic song "Imnul unirii - Pe-al nostru steag e scris Unire", i.e. Union's Hymn - On our Flag is Written Union. 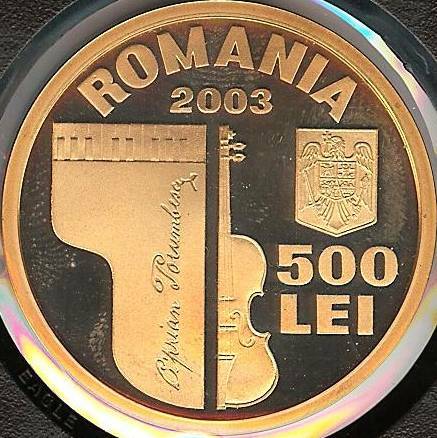 The melody "Three colours", also by him composed, has provided the melody for the national anthem of Romania from the 70's over to 1989. The mechanical musical clock of the Agapia monastery has played for long years the famous Ballad of Ciprian Porumbescu (up until fifteen years ago). Below are presented - through the kind permission of Mr. Alan Glasser - the pictures of a tombac essay for 500 lei 2003 Ciprian Porumbescu.